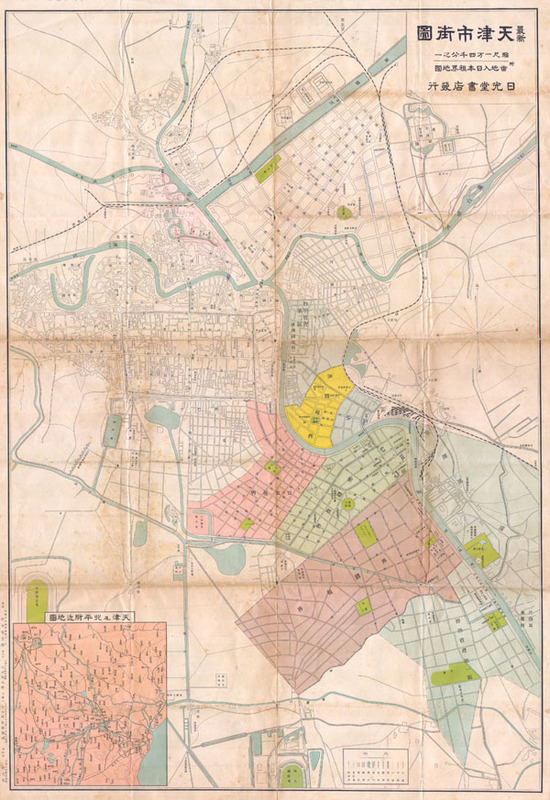 This is an extremely rare map of the Chinese city of Tianjin ( Tientsiin or Tienjien ). Depicts the whole city on the street level with colored areas indicated the British, French Italian, German and Japanese settlements. There is an enlargement of the Japanese settlement. Tianjin is an important port city southeast of Beijing. It was an important port in the 1920s and 30s, reaching its height in 1928 when visiting president to be Herbert Hoover wrote, 'Tienstin is a universal city, like a world in miniature with all nationalities, all architectural styles, all kitchens.' Published by Nikkodo Books in Japan. Good condition. Minor repairs and discoloration to some folds. Good margins. Another map of Tianjin on verso.